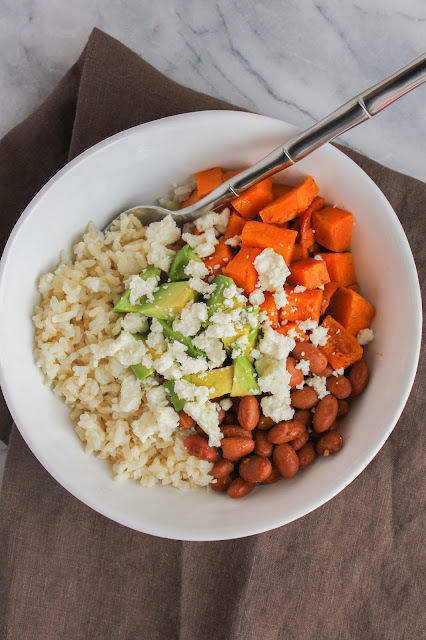 These Sweet Potato and Brown Rice Bowls are hearty, nutritious, and bursting with flavor! It's definitely comfort food in a bowl, plus they are so easy to make! I've always been a big fan of Mexican food. Like, an I could eat it every night of the week type of fan. Tacos, enchiladas, nachos, burritos...you name it and I love it. One of my new favorite meals is a burrito bowl. It's everything you love in a burrito, but without the tortilla and in a bowl instead. I love piling mine high with rice, beans, chicken, lots of different veggies, salsa and sour cream. The thing is huge by the time I'm done with it! My boys have really gotten into these bowls too, and enjoy building their own with their favorite toppings. Recently I decided to do a riff on that burrito bowl by making it a bit lighter and going vegetarian style. I adore sweet potatoes, especially roasted, and thought they would be perfect to star in their own creation. That's when these Sweet Potato and Brown Rice Bowls were born! I roasted a big ole' sweet potato with some olive oil and spices, made a big pot of lime scented brown rice, and kicked my pinto beans up a notch with a bit of cumin. Those three delicious ingredients, plus fresh avocado and crumbled queso fresco made one of the best bowls I've ever tasted. They are nutritious. They are filling. And they definitely are full of flavor. Plus, they're super easy and quick to make! Before we get to the recipe, I have some exciting news to share with you! My friends at the United Dairy Industry of Michigan (UDIM) are giving away 2 tickets to the Michigan International Women’s Show in Novi, running April 28-May 1, to one of my readers! * The show is four days of shopping, fashion shows, celebrities, food, pampering, and more. How awesome is that?! UDIM is proud to be an exhibitor at this year’s Michigan International Women’s Show. Those attending can discover more about locally produced milk, cheese and yogurt by visiting booths #610, #612, and #614. At the UDIM booth, guests will be able to sample cheese sticks, ask nutrition experts their tough dairy questions, and pick up fun giveaways. On Sunday, the first 500 guests admitted to the show will receive insulated tote bags, sponsored by UDIM. On Saturday, April 30th and Sunday, May 1st, guests can head over to the Stonebridge Kitchen & Bath Cooking Stage to watch local experts whip up mouthwatering dairy-inspired recipes. At 11:30 a.m. on Saturday, catch registered dietitian Katie Serbinski, MS, RD as she shares a few of her favorite light and fresh dairy-inspired lunch ideas. At 1:30 p.m. on Sunday, join Dr. Nandi and his wife Kali as they treat us to a dairy-based smoothie demonstration. To enter to win, leave a comment below telling me who you would take to the Michigan International Women’s Show with you! *This giveaway is open to Michigan residents only and will run from April 15th through April 20th. This giveaway is for tickets only, travel and accommodations are not included. Tickets can be used for entry to the show from April 28 through May 1, but are only good for a single day entry. Winners will need to purchase additional tickets if they wish to attend more than one day of the show. Again, be sure to comment below for a chance to win. Now, let's get to the kitchen and start cooking! In a medium saucepan, combine the rice with 2 cups of water, salt, and the lime zest. Bring to a boil, then turn the heat to low and cover and simmer until tender, 20-25 minutes, stirring occasionally. Spread the sweet potatoes on the baking sheet evenly. Drizzle with the olive oil, then sprinkle with the paprika and a pinch of salt and pepper. Using your hands, toss to combine and make sure all the sweet potatoes are coated. Roast until tender, about 20 minutes. In a small saucepan over medium heat, add the beans (with their liquid) add the cumin and a pinch of salt. Cook, stirring occasionally, until warmed through. 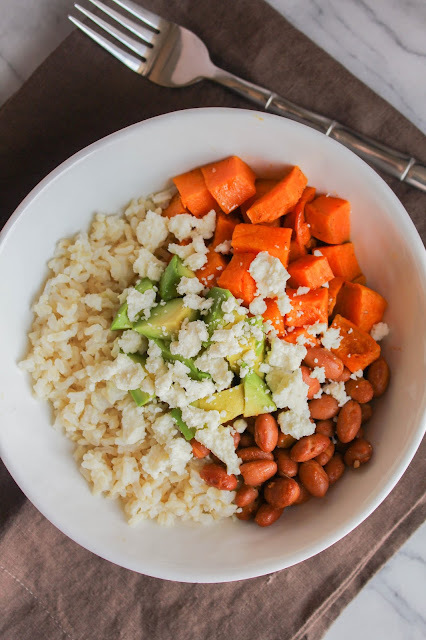 Divide the rice, sweet potatoes and beans among four bowls. 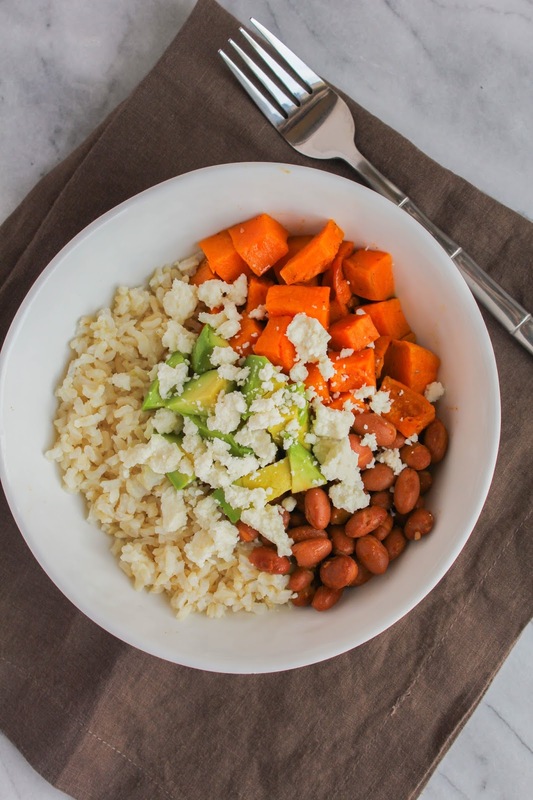 Top each bowl with avocado and queso fresco, and a squeeze of fresh lime juice. I'm honored to be a Milk Means More Ambassador and I thank them for sponsoring this post! I was compensated for developing a Vegetarian Delights recipe, however all opinions, as always, are my own.